I am focused on making meals delicious, healthy and quick, since we, like all of you, live busy lives. We eat dinner around 4:30 or 5:00 p.m. to have intermittent fasting between dinner and breakfast at 7:00 a.m. the following morning. This helps keep us trim, and we love feeling that way at our age. Many days we help a friend in his business until 4:00 p.m. So when we arrive home, we want to fix a meal in record time that is yummy and health giving. I’m sharing our Mexican Pizza as the main course. 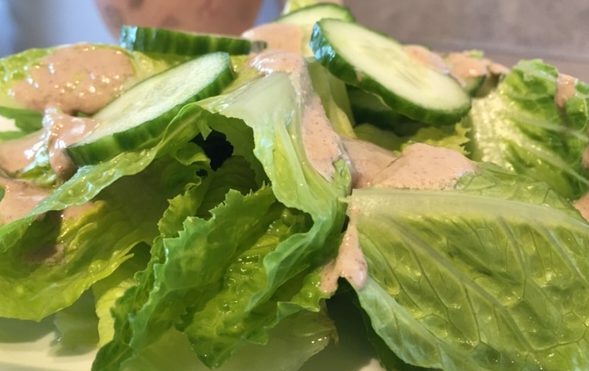 We served it with a simple salad made of greens and sliced cucumber and the nut salad dressing I shared in the last blog. So good, and it took only minutes. 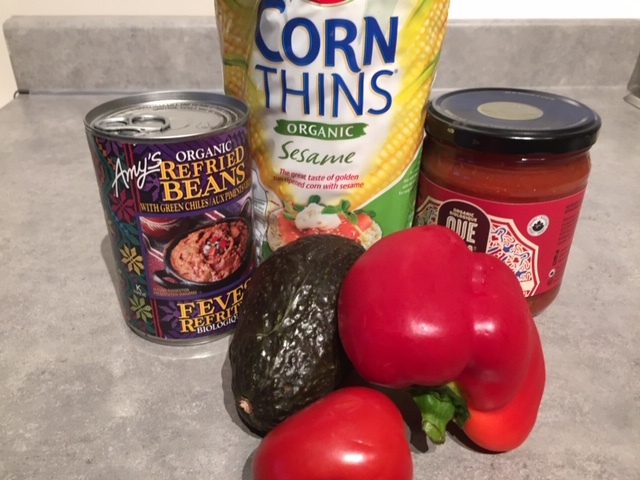 To make the Mexican Pizza, use Organic Corn Thins, Sesame or Whole Grain. I like 4 of them for 4 mini pizzas. 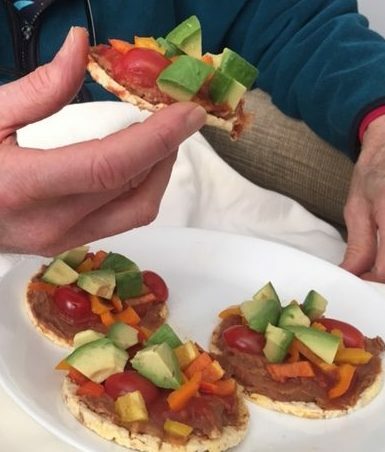 On top we spread Amy’s Organic Refried Beans. Then comes a layer of Organic Salsa. We buy Que Pasa because it’s organic and doesn’t contain sugar. Next come organic diced orange or red pepper and organic diced tomato. Now pop it in the oven until it is warmed through by broiling on high 5 to 7 minutes. When heated, top with diced avocado and enjoy. You see how appealing it looks and the taste is great. Four of these pizzas with a large lettuce, cucumber salad and a nut and seed dressing is a marvelous, delicious meal. Try it for yourself and be amazed at the great taste created in no time. 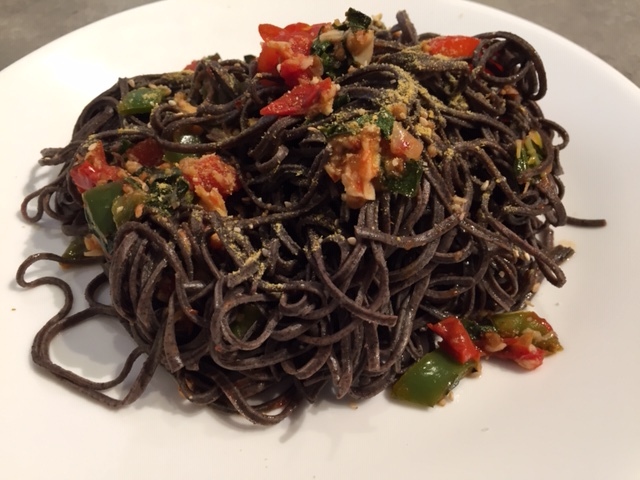 Mandy, a great cook and high nutrient whole food enthusiast, encouraged me to try this new pasta made from black soy beans. The dish I made had a lot of garlic, fresh basil, Roma tomatoes, red pepper, jalapeño and Vegan Parmesan cheese. Bill, my husband, loved it. Couldn’t get enough. The taste and texture are very different from other pastas. It has more body and is slightly chewy. I wanted a much smaller portion than usual because I felt satisfied by less. It’s worth a try to see how you like the taste. It’s high in protein and can be made in a variety of ways. My recipe below shows how I used a few veggies and lots of garlic. 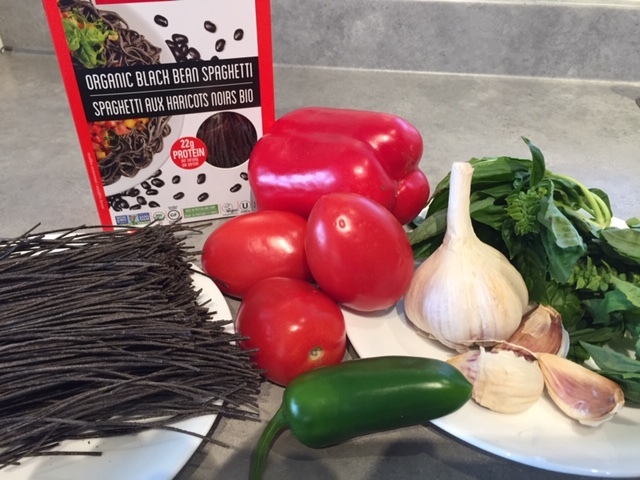 Another way is to create a Mexican pasta with tomato, peppers, cilantro and corn. And when I make it next I’ll use lots of veggies like fresh tomato, peppers, carrot matchsticks, corn, chopped kale, garlic and onion with a parsley garnish. All these veggies will balance the denseness of the pasta. Buy a box and see how you like it. Also, let me know your experience. Another new pasta on the market is made with red lentils. I’ll try that one soon and share its qualities and tastes. I’m also including a Vegan Parmesan recipe. It is so yummy and quick to make in your blender. You can see it sprinkled on the pasta above. It’s a great compliment to any pasta dish. 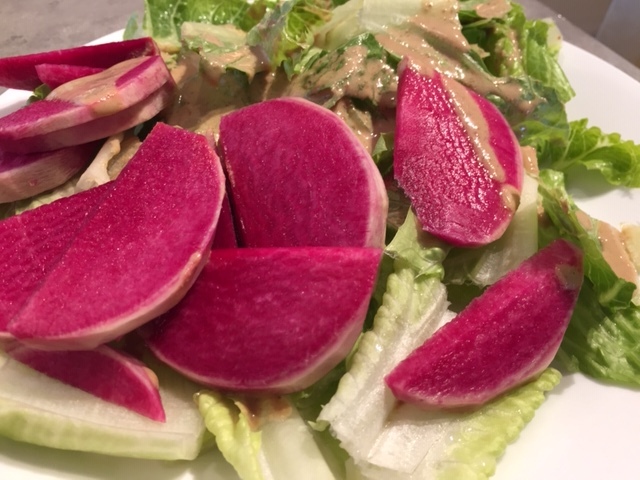 Also, here’s a picture of an awesome salad made with watermelon radish, cucumber and lettuce that I served with the Black Bean Pasta. The dressing is made from nuts and seeds that I shared in a previous blog. It is one of the best I’ve tasted and we use it at home on cooked greens and veggies, as well as salads. Really, do yourself a favor and make it. One big benefit of making your dressings from nuts and seeds rather than free oils, is it can really help keep your weight in check. Follow directions on the box for cooking the Pasta. It’s simple and cooks very quickly. Drain off the water and add 1 tablespoon of Avocado Oil and toss. Add sea salt if desired. Fold in the sauce and serve with Vegan Parmesan sprinkled on top. Combine all ingredients in your blender and blend until it has the coarseness of grated Parmesan that you like. Keep in a jar in the refrigerator. * The original recipe calls for the sesame seeds and cashews to be toasted. This adds a nice roasted flavor, but we’re usually in a bit of a rush so we just use them raw and love it that way. To toast them, you can put them on a dish in the oven and broil for about 3 minutes. Or you can rinse them and toast them in a dry frying pan. Recently I thought about creating a second cookbook, a quick and healthy one to meet the needs of our busy, busy lifestyles. So first I took a trip to our local bookstore to see what’s available and if there really is need to write another. I found 4 healthy, high nutrient, whole foods cookbooks that offer quick and easy cooking. I purchased 2 of them and have the other 2 on order. I want to share all 4 with you. What makes them “quick” is primarily the use of canned beans and lentils rather than cooking them from scratch. This saves hours in preparing a recipe, so even though the canned beans aren’t as nutritious as cooking your own, it’s better to get them in your diet this way than not at all. 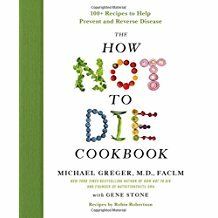 If I could only buy 1 of the 4 it would be the How Not To Die Cookbook, by Dr. Michael Greger. Dr. Greger is an MD and amazing nutrition expert. He sends out 3 free short videos each week on a myriad of health topics. His research is impeccable and he interprets all the science in every day language so it’s easy to understand. I look forward to them every week. You can check it out here. His nutrition research is worth following and applying what works for your life. And his cookbook is fabulous. For one thing, the recipes taste great and contain no free oils. At our house, we have replaced most free oils with nuts and seeds to amp up our health as we age. It tastes great and feels great. You may remember I included nut and seed dressings for salads and greens in several of the last posts. You can view them again here and here. They are so much more delicious and healthy than using free oils. 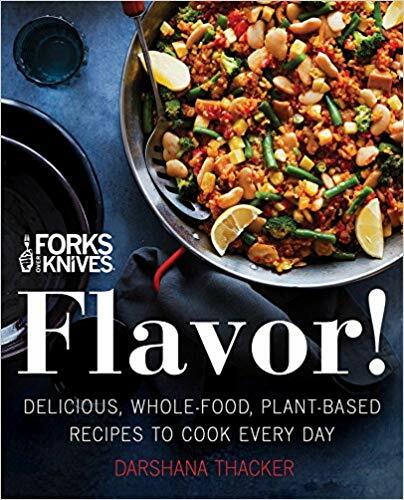 Next I would buy the new Forks Over Knives Flavor! The recipes look delicious and there are lots of them. Forks Over Knives created one of the best videos about food and health. If you have a Netflix account, you can watch it here. Finally, I’d purchase both Oh She Glows and Oh She Glows Every Day. The recipes are great in both books. They’re quick and focused on health and delicious tastes. I love the Oh She Glows cookbooks to give me inspiration and stir my creativity. Her recipes are unusual, and even though she uses some coconut oil and olive oil, she’s very careful with keeping their use to a minimum. I will try the recipes and ideas in all 4 books to see if I feel they fully answer the need for truly quick, high nutrient, whole foods cooking. Then I’ll decided if another Quick and Healthy Cookbook is needed. I’m loving the exploration. And please join me. Let’s learn together with you sharing any great cookbook you’ve found that focuses on whole, high nutrient food and uses as little oil as possible. Let me know what you like about your cookbook and also the recipes you love. 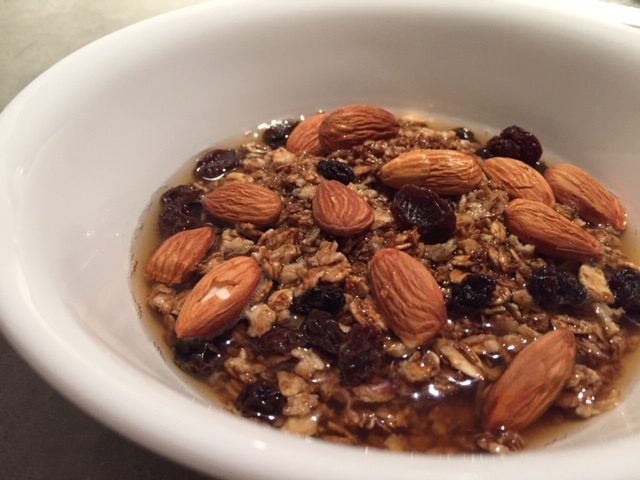 Someone recently asked for our granola recipe to enjoy a healthy breakfast. So here it is. It uses no fats or oils and is truly delicious. 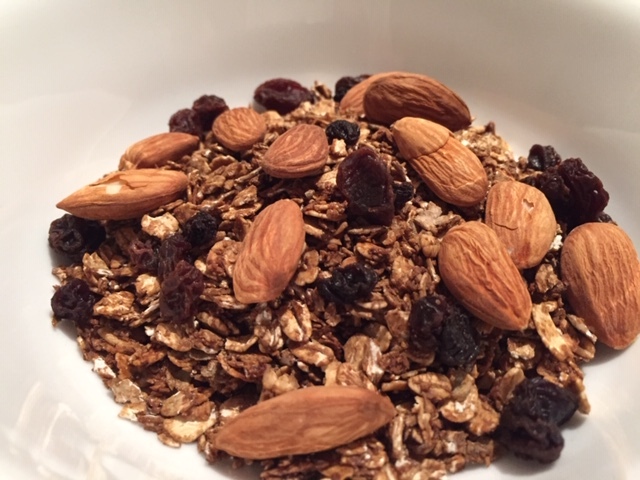 This granola request got me thinking about what is a healthy breakfast? A healthy breakfast for us includes what we always recommend: a wide variety of organic whole foods. At our house that can be a bowl of cooked whole grains with fruit, nuts and seeds. 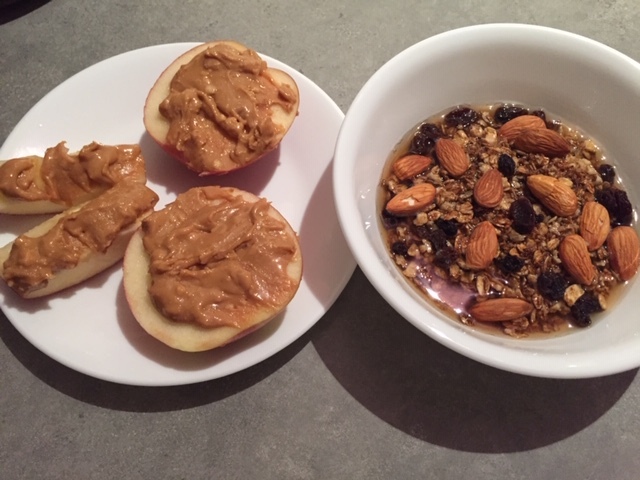 Or I’ll have an apple cut open and spread with nut butter and a smaller serving of whole grains or granola on the side. The whole foods part of our healthy breakfast formula can take more time to prepare than we have some mornings and granola is the way we get around that. Ideally though, I recommend cooking enough whole grain like rice, millet, quinoa or whole oat groats to make 3-4 breakfasts. Store it in the fridge and just reheat the amount you want for breakfast each day. But when we don’t have the precooked grain, and we’re in a hurry, we opt for our granola. 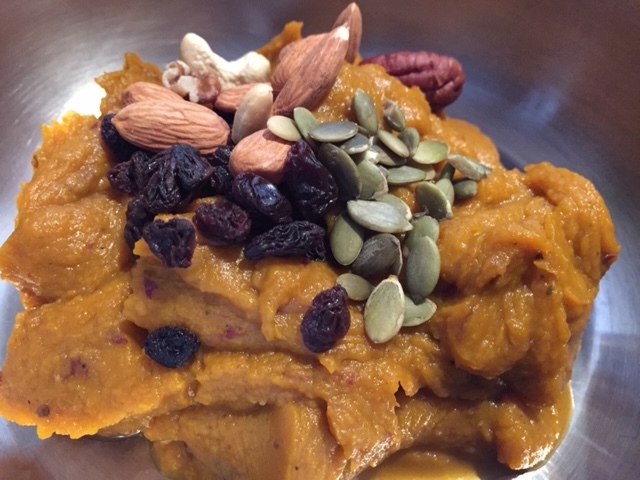 When not doing grain with fruit, my husband Bill often has unusual but delicious healthy breakfast by enjoying Kabocha or another Winter squash, baked with yams and sweet potatoes. He loves Kabocha for its deep flavor and sweetness. And if he can’t find it, he’ll choose Buttercup or Butternut. He purees these with yams and sweet potato in the food processor to become a thick pudding. On the side he has steamed greens and veggies with a nut and seed dressing. This is such a great healthy choice. He calls this his “pumpkin pie” breakfast because he adds cinnamon. Below are the recipes for our homemade granola, and Bill’s recipe for his all-veggie, “pumpkin pie” breakfast. Try them both and see what you like. The key is to choose breakfast foods that are whole, organic and give a variety of nutrients and tastes. Notice no processed foods like bread or muffins, dairy, coffee, or animal foods are included. These standard breakfast foods that most people eat are inflammatory and take extra energy for the body to process. Turn oven to 350 degrees Fahrenheit. In a large bowl mix the above ingredients with a large spoon or with your well-oiled hands until the grains are well coated. Put in 1 or 2 large baking dishes so mixture is 1 inch high for even cooking. Bake for 20 minutes, then stir and bake an additional 20 minutes until lightly brown. When cooked, cool, then add to a large Ziploc bag for easy use. We don’t go through ours very fast, so we keep it in the freezer to keep it fresher. When serving, add nuts, seeds, raisins and/or fresh fruit. Also yummy if you pour hot water over granola, cover with a plate and let steep 5 minutes so water is absorbed, and you have a moist, delicious serving. If using Butternut squash, after cooking, scoop squash out of skin and discard the skin. All other squash can be pureed with their skin. 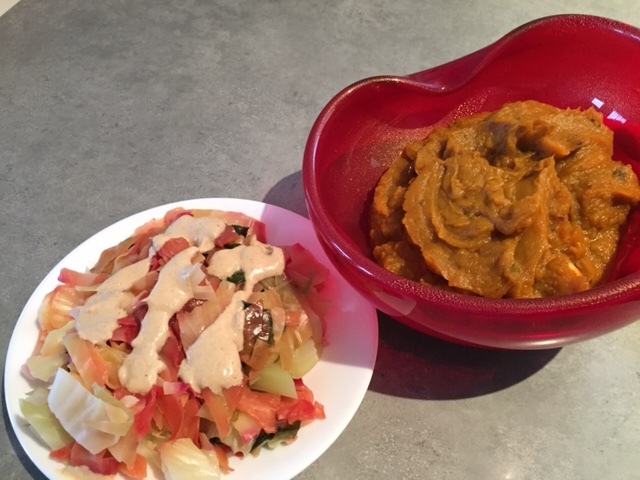 Add squash, yams and sweet potatoes to food processor and blend until pureed. Add some ground cinnamon if you wish. This dish is great served for breakfast with a side of steamed kale, cabbage, and veggie leftovers from last night’s dinner. Daily we cook extra greens and veggies to give Bill a breakfast serving the next morning.